Listening to the gurgling waters of the Wallenpaupack Creek on a warm, lazy afernoon. Sitting on a lawn chair just behind the Sterling Inn, a couple of feet from the bank of the creek. The smell of freshly-cut lawn mingled with the scent of the forest on the other side of the water. You reach down to scoop a handful of water. It's feels clean and cool. A flash of red and another of blue signal a cardinal and a bluejay darting into the woods, deep in the Pocono Mountains of Pennsylvania. The romantic Pocono Mountains have been attracting honeymooners for decades. While most stay at posh resorts, many are beginning to discover the delights of the region's county inns, which have long taken a backseat to resorts with champagne-glass tubs and glowing fireplaces. While the latter offers modern amenities, the former offers sumptuous comforts and the romantic aura of another time. Tucked away into peaceful corners of lush Pocono valleys and mountainsides, these quaint establishments and their innkeepers are dedicated to the age-old tradition of innkeeping. Individualized accommodations and fine cuisine, as well as personal service have become their hallmark. The inns' gracious hospitality and their picturesque surroundings seem to be in perfect harmony with Mother Nature. These inns offer variety--a turn-of-the-century farm house, a storybook French chateau or a restored Tudor manor. Adorned with Victorian and early 20th-century collectibles, lace, wicker, and family heirlooms, each has its own distinctive character. Brass and four-poster beds, armoires and dressers grace the guest bedrooms, suites and cottages. Overstuffed parlor chairs nestled next to massive fireplaces and wooden rockers on grand verandas beckon the two of you to relax and unwind after your hectic wedding. Where have these inns been while the Pocono resorts received all the attention. All seven of them were inns or guesthouses long before the other resorts were even open. But due to changing travel habits and tastes, they fell out of favor. Now under the loving hands of dedicated innkeepers, they have once again been reborn. The Sterling Inn, in Sterling, is more like an old-fashioned resort. Located on a back road, it offers enticing hiking and walking trails on its 103-acre property and nearby. One even leads to a waterfall on the ridge behind the inn. There's an indoor heated pool and a little pond with willow trees and a few ducks. But its the inn's natural setting that gives it its charm. Originally built in 1860 on what is believed to be the site of an Indian village, the first major expansion came in 1911, when a large dining room and sitting area with fireplaces were added, as well as 20 guest rooms. Those were the days of hall baths, with washbasins on the dressers and chamber pots under the beds. Long gone are those inconveniences. One of its buildings was a former school house which was later purchased and converted to additional rooms. In 1927, the Hilltop portion of the inn was sold by the Edwards family to Mrs. Alice Julian, who owned it until the present owners, Ron and Mary Kay Logan, bought it in 1982. Though the actual date of construction of Hilltop is unknown, a newspaper discovered under old wallpaper was dated 1868. Two other homes built sometime in the 1870s, the Guest House and the Meadowlark Cottage, are also a part of the inn. Today, ten buildings provide 38 rooms and 16 suites in a variety of styles. Rooms are $160 and suites $220 per couple, including breakfast and dinner, weekends. The magnificent French Manor in South Sterling, also owned by the Logans, is a stone chateau possessing many of the features of Joseph Hirschorn's actual French manor in the south of France. One hundred and sixty-five craftsmen and artisans created the elegant hunting lodge for him using natural lumber and fieldstones from the Huckleberry Mountain. Leaded glass doors and windows, an imported Spanish slate roof, a Romanesque arched entranceway, a spacious stone veranda and massive stone fireplaces attest to the artisans' mastery. A more upscale place that doesn't take children, its rooms, with breakfast, are $180 to $225 weekends. The Settler's Inn of Hawley was built in 1927 by the Hawley Community Hotel Company. Believing the town would benefit from having a "grand Hotel" to house the hundreds of visitors to Lake Wallenpaupack, the new company sold $100 shares in the new hotel and a goal of $145,000 was set for the 55-room hotel's site, equipment and furnishings. Unfortunately, the Crash of 1929 halted construction until the 1930s when it was purchased, finished and run as The Tudor Manor well into the 1960s. After being sold again, the Arts and Crafts period building functioned as a boy's school, a nightclub and as housing for the elderly. The 54-room hotel was purchased yet again in 1980 by present innkeepers Grant and Jeanne Genzlinger, who combined the former rooms into 18 larger ones and began restoring its former glory. Now its chestnut wood beams, native bluestone fireplace, outdoor patio and beautiful herb gardens add to the ambiance of this Tudor manor. All rooms have private bath and are $83 to $113 on weekends, including a full breakfast. The Pine Knob Inn began life as a tannery. In 1847, George Northrup and Dr. Gilbert Palen opened a tannery in what was then Frogtown. Prior to the Civil War, the two men built homes side by side along he Brodhead Creek and, taking the name for the hemlock tree, Tsuga Canadensis, which furnished the bark for the tanning of sole leather, Dr. Palen renamed Frogtown Canadensis. The tannery closed in 1875, and the building was turned into a guest house in 1886. Dr. Palen's home became the Pine Knob Inn. The addition of two small guest houses and a cottage in the 1900s enabled the inn to increase its capacity from 30 to 50 guests. Innkeepers, Bob and Kathy Overman purchased the inn in 1985 and have turned it into a romantic couples' retreat, reminiscent of an English country house. Rooms here are $158 to $190, with full breakfast and dinner, weekends. Originally an equestrian center, the manor house of the Inn at Meadowbrook, near East Stroudsburg, was built in the mid-19th century by the Sebring Family. The mill house, built in the late 19th century, was a working grist mill. The Inn's trademark dining room, added in 1924, features a 15-foot ceiling, arched columns, raised fireplace, tall Palladian windows and French doors. In 1940, the property was purchased by a European horseman who built the stables and began inviting guests to join him for horseback riding. Many famous authors and actors were among his guests. Twenty years later, the stables were expanded and a large indoor riding arena was added. Bob and Kathy Overman purchased the Inn in 1985 and renovated it into a country inn. Rooms, with shared or private baths, are $60 to $95, including country breakfast. 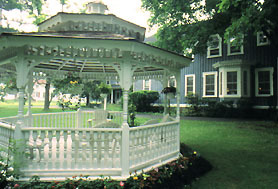 Built in 1890, the 10-room Frogtown Inn, in Canadensis, also began life as a farmhouse. Its owners began taking in guests and soon it became known as the Old Village Inn. It has been renamed by its present owners, Stanley and Carol Zimmer, who have restored it. Maple trees line the drive and a trout stream flows through its six acres. Its romantic cozy rooms are $80 per couple, including a full breakfast. Crescent Lodge, in Cresco, has been owned and operated by the Dunlop family since 1946. Now in its third generation, the Inn manages to combine both the quaint charm of yesterday with the modern comforts of today. Thirty individual guest rooms feature canopy beds, intimate balconies and wall fireplaces was well as whirlpool tubs, Jacuzzis and sundecks. A very special one high up in the woods, is perfect for honeymooners who want to be left alone. Rooms are $100 to 150 on weekends. Cottages start at $170. Perhaps it's the intimate ambiance of these inns or their attention to detail that contributes to their inviting atmosphere. Family run, sometimes for generations, they never leave their guests wanting. And each is preserved with care and authentically furnished, bringing history to life. The Pocono country inns are known for their fine and personalized service. And that service usually extends to meals. Sumptuous meals are elegantly prepared, often by innkeepers themselves, and served in convivial dining rooms appointed with laces and linens, fine china, candles, flowers and spectacular views of Pocono mountain scenery. What, after all, can compare with the taste and aroma of home-baked breads, cakes and pies, locally grown fruits and vegetables that explode with color and flavor, and fish and game from nearby farms that are uniquely prepared and vary from season to season. The menus are as varied as the inns themselves. Each inn's cooking approaches gourmet, with specialties to fit every taste. The Sterling, for instance, offers braised stuffed pork chops Emmenthalaer, while Crescent Lodge offers roast duckling. The Pine Knob Inn proudly serves a five-course, candlelit dinner, featuring whole stuffed lobster. Settler's Inn, uses Pennsylvania beer, wine and cheeses and plans its menus around the harvest of its own herb garden with over 15 varieties of herbs and spices. Or guests can choose from either a creamy risotto with wild mushrooms or venison with chestnut puree. For those wishing for a taste of Europe, the French Manor and Frogtown Inn serve authentic French cuisine. Frogs legs Provencal, home-smoked salmon, potage with rabbit, and roast duck with blackberry sauce are just some of the enticing entrees. After dinner, guests gather in amiable parlors and pubs or on grand verandas for conversation or table games. Each inn serves its guests a hearty country breakfast, often included in the price of a room. The Inn at Meadowbrook invites its guests to begin their Sundays with fluffy pancakes and bacon. Pine Knob serves a gourmet breakfast on Sunday, complete with sausage and biscuits, Belgian waffles, and blueberry pancakes. 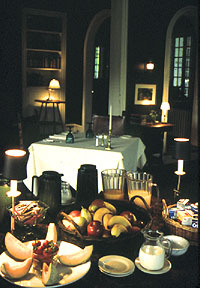 The French Manor serves an elegant brunch. For many, the Poconos are synonymous with breathtaking scenery and invigorating outdoor activities. All the innkeepers can make arrangements for canoeing, tennis and golf or guests can go hiking, fishing, and swimming in nearby ponds and lakes. Antique lovers will find numerous shops and cooperatives in and around Hawley. Whether you're planning your wedding or perhaps just want a romantic weekend away with the one you love, you'll soon discover that the inns of the Pocono Mountains are just the ticket.